BRISTOL - When starting pitcher Jagger Duquette takes the mound for the Bristol Eastern baseball team, he does with one main goal in mind: to still be standing on the mound when the final out is recorded. That goal didn’t change Wednesday afternoon against New Britain. Duquette accomplished his goal and likely exceeded it, twirling a complete game shutout while striking out 10 Hurricanes in a 6-0 win for the Lancers. New Britain (0-3) managed just two hits off Duquette, and has now scored just three runs over its first three games, as the offense struggles to find a way out of its early funk. Given how Duquette was pitching for the Lancers (2-0), there was little room for mistakes for the Hurricanes in the field. When they did commit an error in the bottom of the second, Eastern pounced with a pair of runs that would be plenty of support for Duquette. The scoring in the bottom of the second started when Ian Latko crushed a double to left field and scored on a slow grounder to second off the bat of James Dauphinee, which New Britain second baseman Justin Adorno fielded and flipped over the head of first baseman Nigel Crundwell. 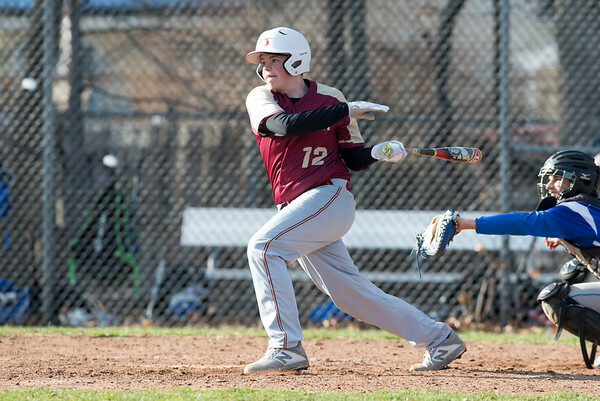 The error proved double costly when Jacob Bouchard stepped in and laced an RBI double down the left field line to score Dauphinee and provide valuable production from the ninth spot in the order for the Lancers, who led 2-0 after two. New Britain had a chance to get to Duquette in the top of the second. Danniel Rivera led off with a walk and advanced to third on a balk by Duquette and a sacrifice bunt by Kevin Slisz. But Duquette responded with back-to-back strikeouts of Crundwell and Chris Gibbs to wiggle free of the jam and end his second inning of work with four of the first six outs coming via strikeouts. The Lancers widened their lead in the fourth after a leadoff double by Anthony Marrotti sparked a three-run inning. After a walk to Dauphinee, Devan Jacques drove in Marrotti with a single to left, and after a passed ball scored Dauphinee, Carson Sassu followed with a single of his own to plate Jacques and stretch the Eastern lead to 5-0. New Britain’s best chance for a comeback came in the fifth, when Crundwell led off with a single and Gibbs reached on an error to put runners on first and second with nobody out. Duquette, back in his favorite pressure-packed scenario, responded with three straight strikeouts, including a third to leadoff hitter Michael Gajda to spark a spirited celebration from Duquette as he ran back to the Lancers’ bench, having struck out 10 Hurricanes through five innings. Eastern tacked on another insurance run in the bottom of the fifth on an RBI single from Dauphinee, scoring Matt D’Amato, who reached on a single earlier in the inning, his third hit of the game. Meanwhile, Duquette seemed to keep getting better as the game went on, retiring nine straight batters to end the game, starting with his trio of strikeouts to escape trouble in the fifth. The only hits for the Hurricanes came via singles from Crundwell and Adorno. Posted in New Britain Herald, New Britain on Wednesday, 10 April 2019 21:33. Updated: Wednesday, 10 April 2019 21:43.